Full 292 timetable from 16 April 2018. The first bus from Ludlow to Kidderminster will leave at 8.30am. The last will depart at 6.30pm and will only go as far as Clee Hill. The last bus to Cleobury Mortimer heads off from The Compasses at 4.30pm. If you are travelling from Cleobury Mortimer to college or to work Ludlow, your first bus inwards is at 8.04am. It gets here at 8.28am. Looking the other way the first bus from Cleobury Mortimer to Kidderminster is at 7.40am arriving at 8.37am. I would welcome views on this new timetable. It will apply until the end of August 2018. Changes may be made at that point based on the experience of the first few months. The new service will be run by Diamond and R&B. The Ludlow to Kidderminster service is contracted by Worcestershire County Council. Shropshire Council contributes £37,000 to the joint subsidy. But here in Shropshire, we have struggled to get any information from WCC about this routine reletting of the contract. Every now and again, a bus service collapses as a provider goes into administration or just gives up on the route. That has meant fast action within 24 hours to get new operators on the road. But the Ludlow to Kidderminster service was not an emergency procurement. It was the routine retendering at the end of a contract. I am appalled by the way this reletting of a routine bus contract has been handled. We need buses for our bucks. Shropshire Council must learn from this chaotic episode. The council must to insist on greater control over the bus services that run from our county into another. WHY IS YOUR LUDLOW TO KIDDERMINSTER BUS TIMETABLE DIFFERENT TO R&B WEBSITE. URGENT I NEED TO KNOW WHICH IS CORRECT. I didn’t know that R&B had a website so can’t check. 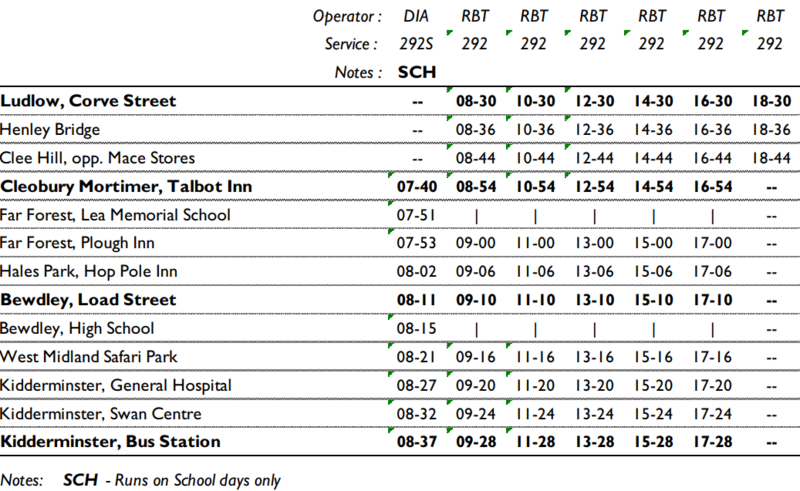 But the likely answer, as the timetable I have published shows, is that Diamond is running some of the service.